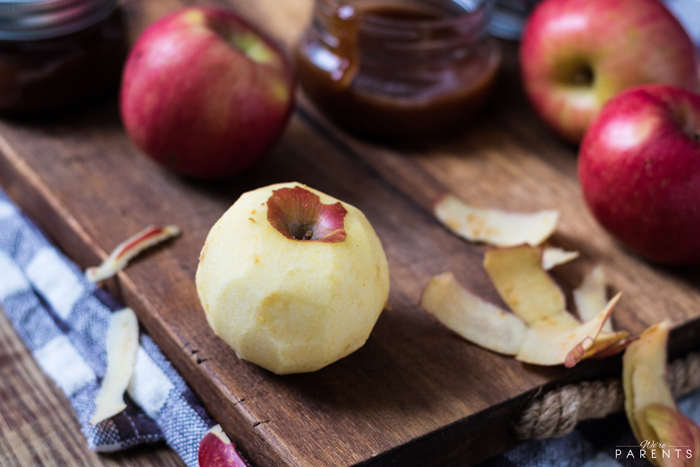 Somewhere between caramel apple dip and indulgent fruit sauces you have this decadent caramel apple sauce recipe. Once you make it you’ll want to pour it over cheesecakes, stuff into doughnuts, drizzle over cupcake frosting, spread on pancakes, and more. Growing up in West Virginia there weren’t many things to do. Every year though there was a small carnival that came to our tiny town. It was there that I discovered my love for caramel apples. It was one of the few times that we were allowed to get two treats when we went somewhere – caramel apples and cotton candy. Of course, there came a stipulation — you had to eat the actual apple if they were going to buy one. I used to try to figure out how to eat the entire middle of the apple and leave the caramel and nuts until the end. Unfortunately, I was never great at that! I’ve never outgrown my love of caramel apples. However, as I’ve grown older, I have figured out that my true love is not necessarily with the apples, but with the caramel sauce. Andrew and our girls share this love with me too. I’ll never grown out of my fondness for caramel apples or caramel, but this caramel apple sauce recipe is my current love obsession. What is caramel apple sauce? Caramel Apple Sauce is a simple caramel sauce recipe that has been cooked with actual apples and apple pie spice. After cooking down, the apples are mashed into the liquid sauce. You can either leave the tiny bits inside or it can be strained to remove any chunks. 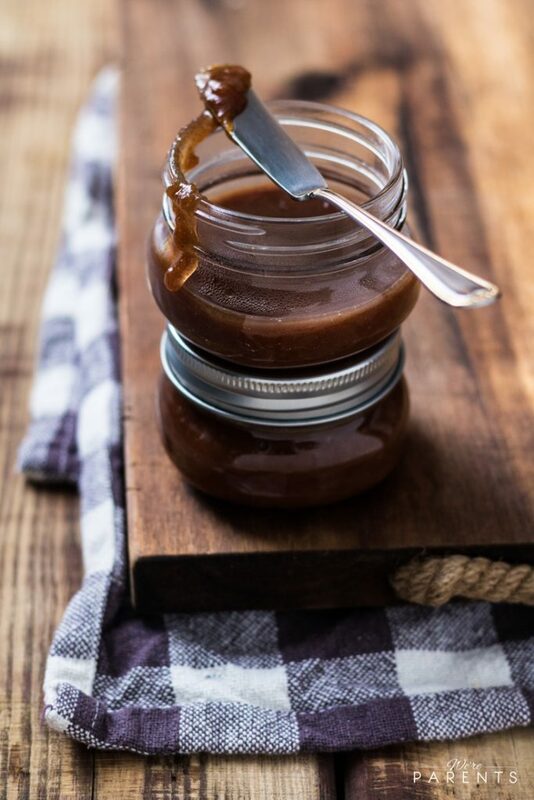 The end result is this decadent caramel apple sauce that will leave your mouth watering for more. What are the ingredients in caramel apple sauce? 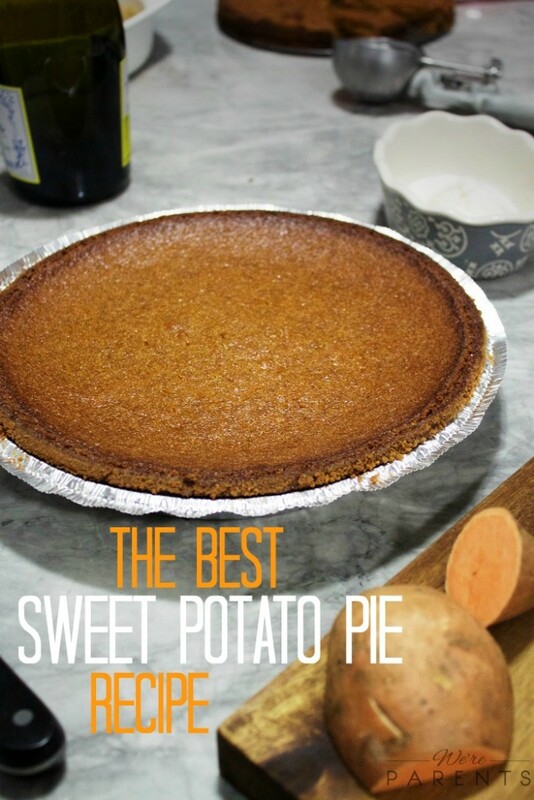 It’s proof that you don’t need a ton of fancy ingredients to have a truly remarkable recipe. Can I make this a vegan caramel apple sauce? The only ingredients in this recipe that make it not vegan are the butter. 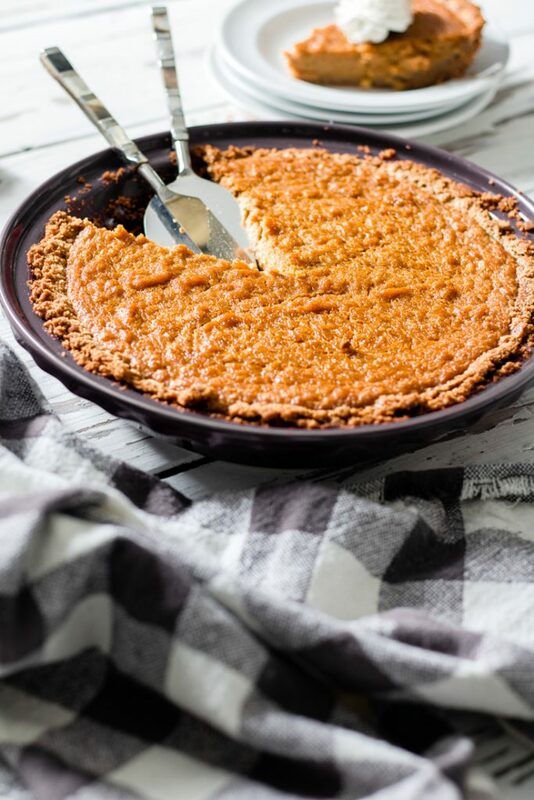 You can simply swap that ingredients with a vegan approved butter (we like Earth Balance Soy free) and proceed with the recipe as called for. 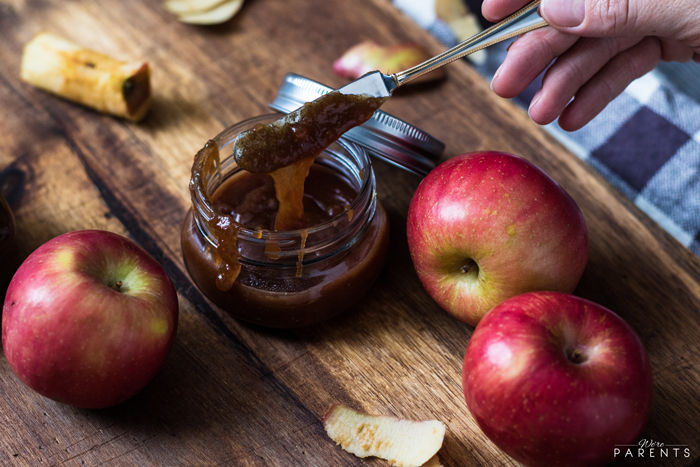 How can you use caramel apple sauce? 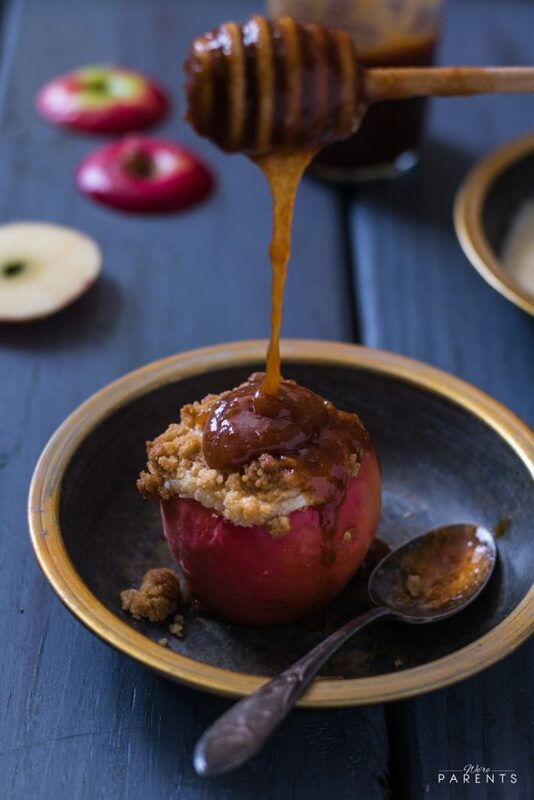 Try this amazing caramel apple sauce recipe these these Caramel Apple Cheesecake Baked Apples! 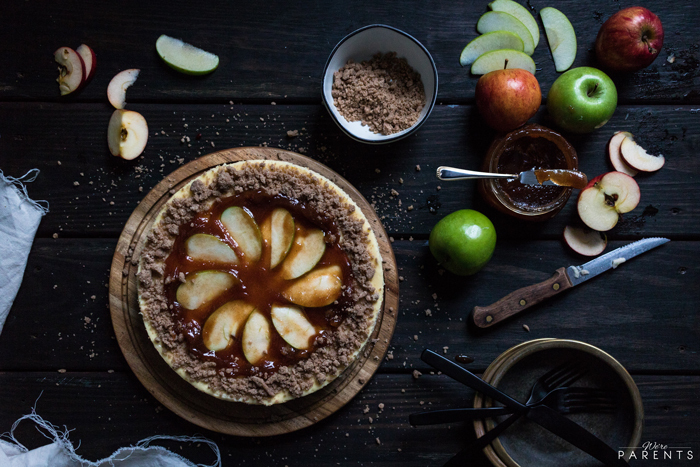 Or spread on this delicious Caramel Apple Cheesecake! How do you make caramel apple sauce? 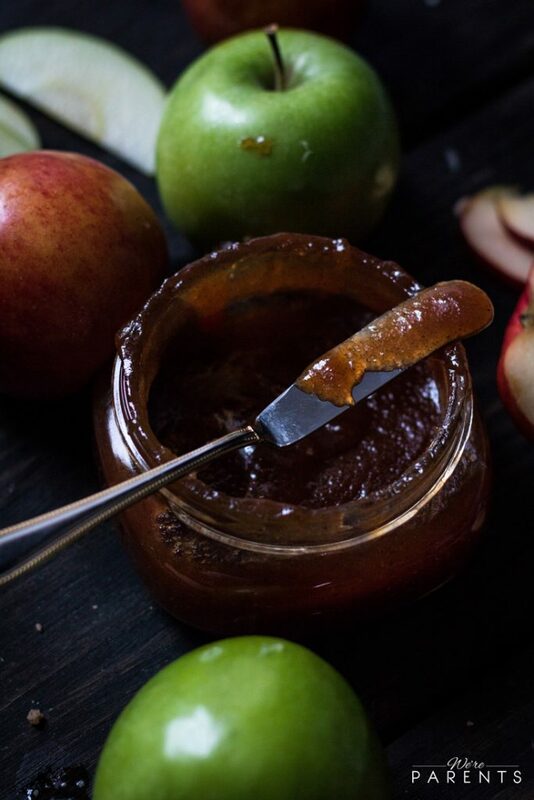 Somewhere between caramel apple dip and indulgent fruit sauces you have this decadent caramel apple sauce recipe. Once you make it you'll want to pour it over cheesecakes, stuff into doughnuts, drizzle over cupcake frosting, spread on pancakes, and more. In a bowl, combine the brown sugar, cinnamon, apple pie spice, and nutmeg. Set aside. In a bowl, combine the diced apples and juice from one lemon. In a medium saucepan, add 1/2 cup of water over medium heat. Once water begins to boil, add apple and lemon mixture. Occasionally stirring. After about 10 minutes, the water should be almost evaporated and the apples beginning to break down. Add another 1/4 cup water. After that 1/4 cup water almost evaporates, add the cider. Stir to combine. Let cook for two minutes, then add the butter. After butter has melted, add the brown sugar mixture. Let cook, stirring often, until brown sugar has completely melted and caramel apple sauce is well combined. If any chunks remain, you can use a masher to make them smaller. This post was originally published on 3/9/2018. Updated on 4/5/19. 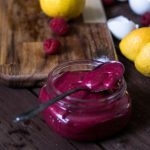 Lemon Raspberry Curd is sweet and tart making it an amazing filling for pies, doughnuts, cakes, and more. 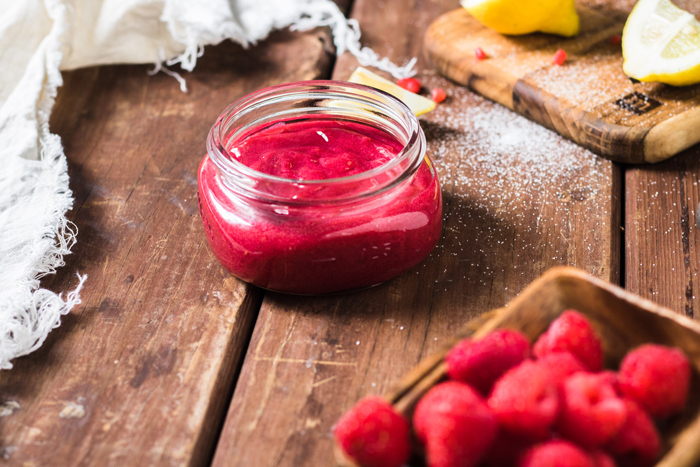 This lemon raspberry curd recipe also makes a great edible gift. About two years ago now, I made lemon curd for the first time to go into some hand pies I was trying out. When I told Andrew what I was making, he cringed. Why would anyone call it curd? What an awful name for something you are eating. I reminded him that he loves cottage cheese and those are also called curds. He wasn’t amused. Nonetheless, it was one of the best desserts I had ever had. I was literally licking the lemon curd off the spoon. He also agreed is was an amazing dessert and we spent the next few days putting it on everything we could think of in our house. I wanted to try out other varieties and see if they were just as amazing. It had gotten pushed to the back burner until recently. And boy once I made this lemon raspberry curd, I was so disappointed I had never made it sooner. It was amaziingggg. We’ve made it multiple times since the first and it’s even better than just regular lemon curd. Why is it called curd? A curd is smooth, thick, creamy spread that is in the same family as jams and preserves. The earliest accounts show lemon curd being made and referred to as lemon cheese. It explains that lemon juice was added to cream to make curds. As time has evolved, a curd now refers to a citrus fruit (lemon, lime, orange, etc) being combined with eggs and sugar, and sometimes butter. 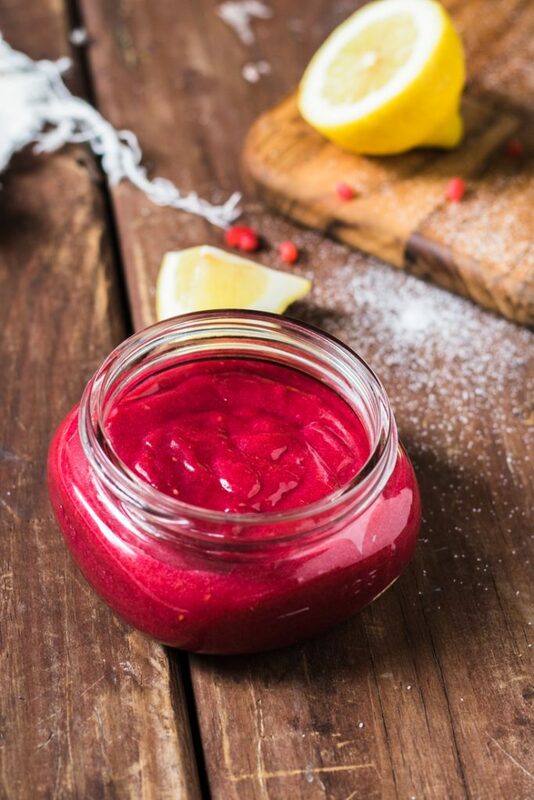 Berries, like in this lemon raspberry curd, are sometimes used as well. What are the ingredients to make lemon raspberry curd? What do you use lemon raspberry curd for? Fruit curd is used for a variety of treats like scones, pies, and in between cake layers. However, it can also be used on bread or toast, muffins, waffles, pancakes, cheesecake and more. Some people also mix curd into yogurt or cottage cheese. The possibilities are really endless. 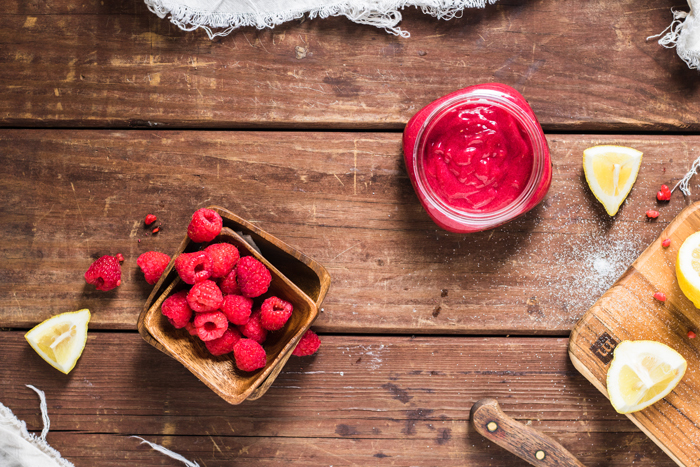 How do you make Lemon Raspberry Curd? In a bowl, whisk together sugar and eggs. 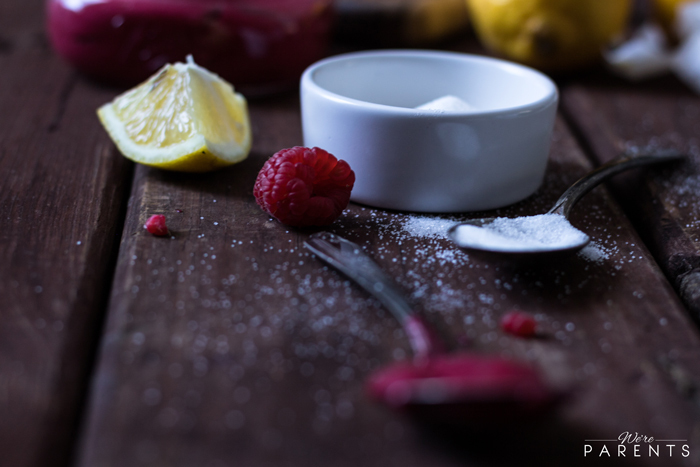 In a medium saucepan, over medium low heat, add raspberries, lemon juice and lemon zest. Heat until raspberries start to break down (around 5 minutes), carefully stirring watching to ensure it doesn't burn. Add in the sugar mixture and constantly whisk for 2 minutes. Stir often until it begins to thicken (about 5 minute). Add butter and continue stirring often until all butter is melted. Over a bowl, use a strainer to press the solids out of the mixture. Refrigerate until cold (at least 4 hours). Keep refrigerated in air tight container for up to 10 days. 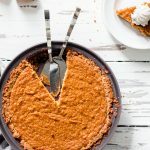 Whether you put this in pies, spread on tarts, or lick it off the spoon (I won’t judge) you’ll want to make this ASAP. Promise me you will make this soon! 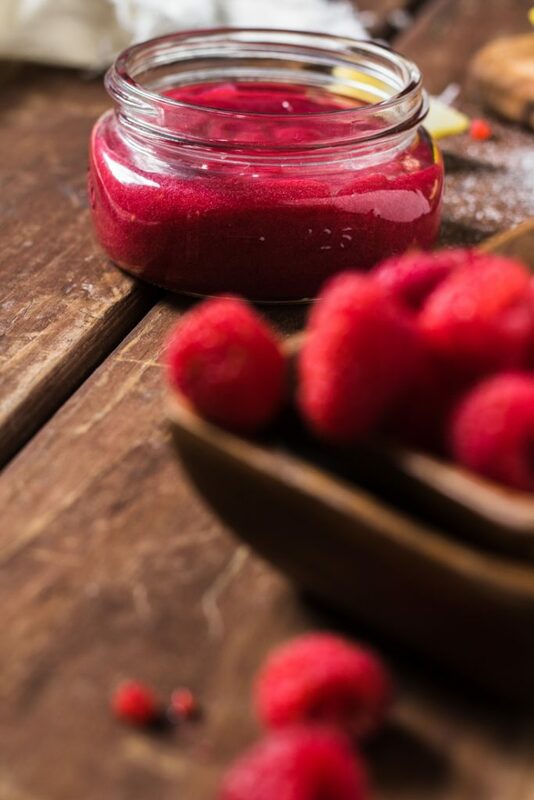 Pin this Lemon Raspberry Curd recipe for later! 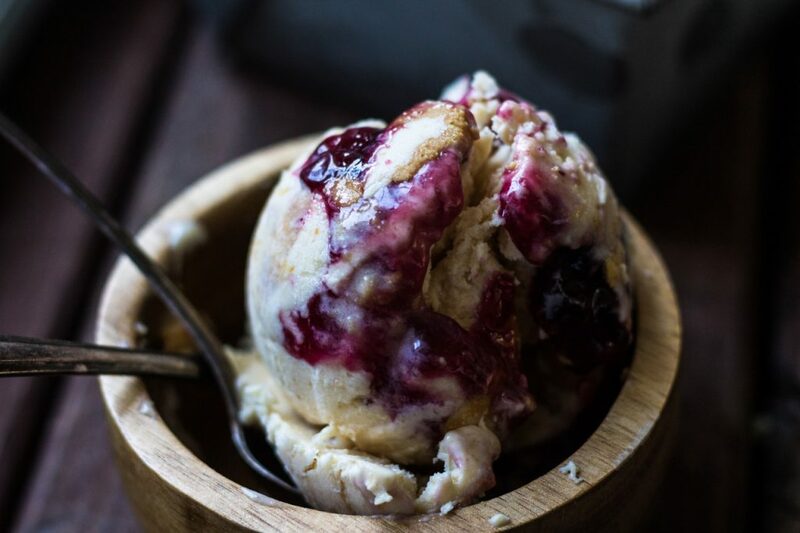 Peanut Butter and Jelly ice cream is the ice cream of your childhood dreams. 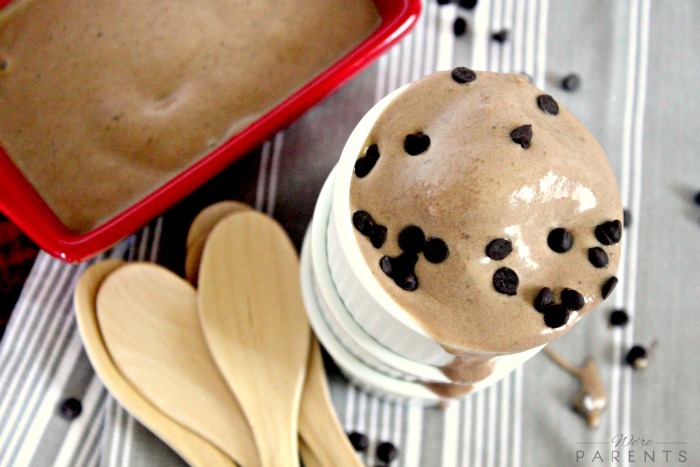 Whole family approved, this homemade ice cream recipe is a huge hit! 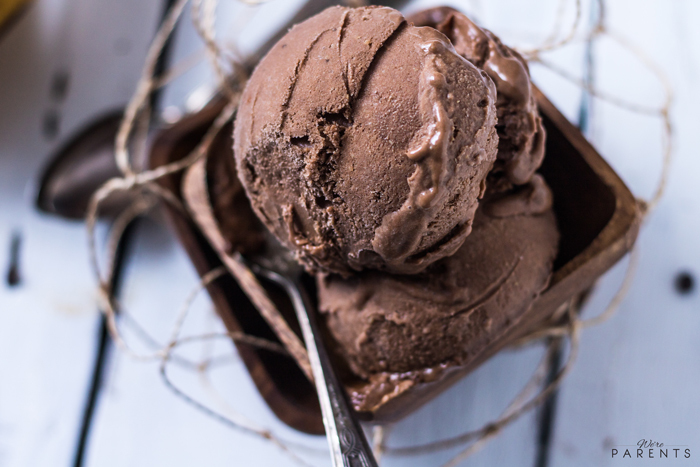 Disclosure: This post is sponsored by Scoop Adventures: The Best Ice Cream of the 50 States. Thoughts are opinions are my own. Affiliate links are contained in this post. Someone told me before that they didn’t really like ice cream. Errr???? Freeze. Excuse me? How do you form your lips to speak that? I will never understand. My only exception is anything mint. Keep that away from my taste buds. But seriously, how do you just not like ice cream as a whole being. There are endless possibilities to flavor combinations and delicious toppings and cones and oh my gosh how do you not like ice cream. A few years ago, we got an ice cream maker, but only attempted to make chocolate ice cream from the book it came with. 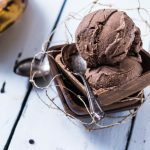 I was tired of another appliance sitting around not being used, so I decided to sit down with Scoop Adventures: The Best Ice Cream of the 50 States , and try out some of their delicious ice cream flavors. There are over a hundred recipes and I had no clue where to even start. I quickly turned to see what New Jersey and West Virginia had to offer since they are closest to my heart. 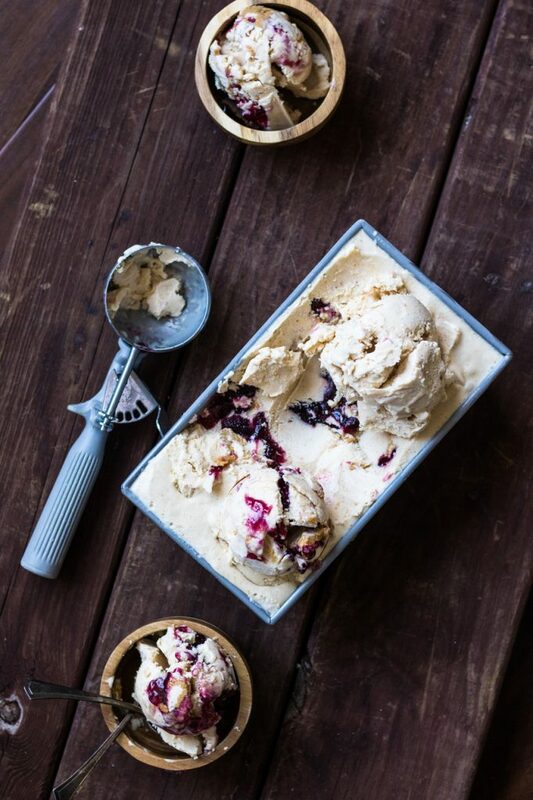 New Jersey features Sweet Basil Ice Cream from The Bent Spoon in Princeton, New Jersey. 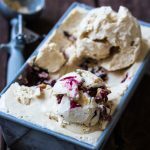 And, West Virginia features Pink Panther Ice Cream, a recipe adapted from Ellen’s Home Ice Cream in Charleston, West Virginia. Neither of them sounded exactly like something everyone in our family would like so I asked Andrew to pick. He said, “Peanut Butter and Jelly Ice Cream”. It sounded amazing and weird all at the same time, but I was going for it. 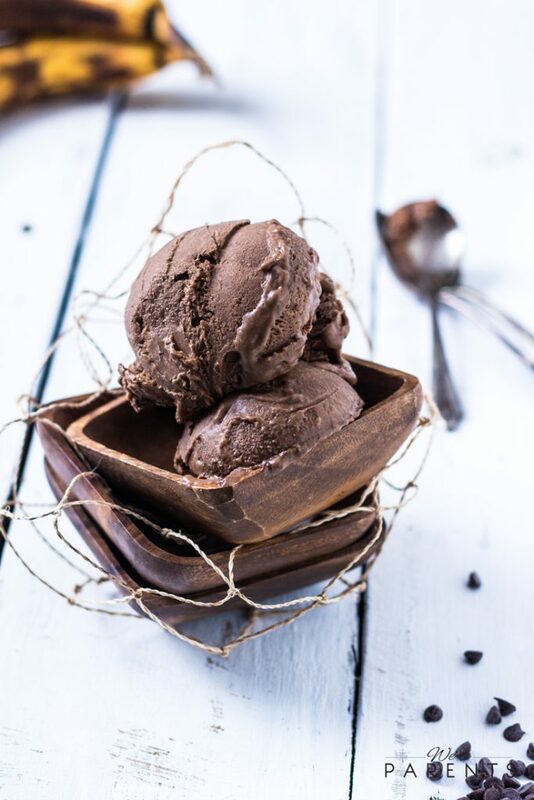 The first time we made this homemade ice cream recipe, we stayed pretty true to the recipe in the cookbook. However, that’s not really my style and I immediately knew how I would change it up the next time around. 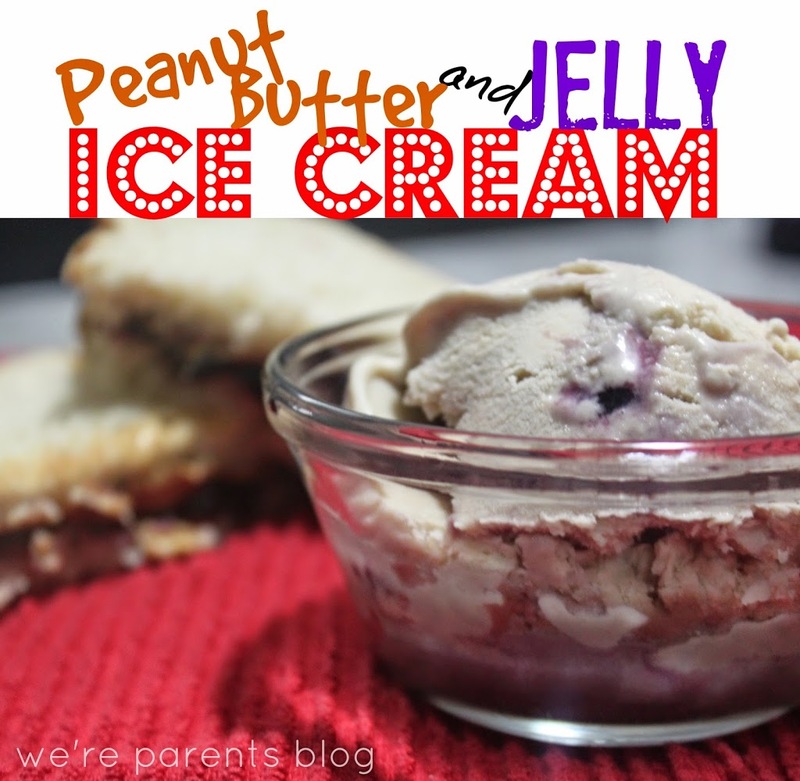 The kids loved this peanut butter and jelly ice cream recipe and Andrew and I both agreed it would be a hit with some slight changes. 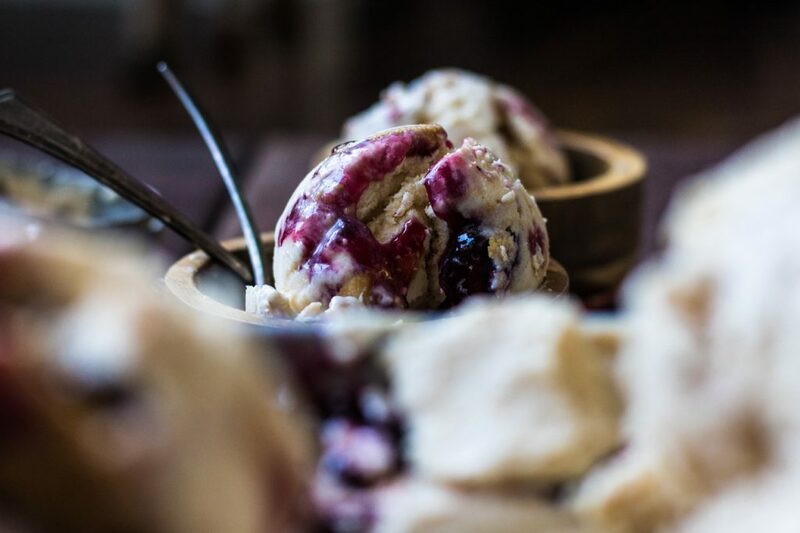 It literally tastes like you are eating a peanut butter and jelly sandwich but mixed into deliciously churned homemade ice cream. Fill a large bowl with ice water. Set aside. In a small bowl, combine 2 tablespoons of the milk with the cornstarch, whisk, and set aside. Whisk the peanut butter and salt in a medium bowl and set aside. In a small bowl, combine 2 tablespoons of the milk with the cornstarch, whisk, and set aside. 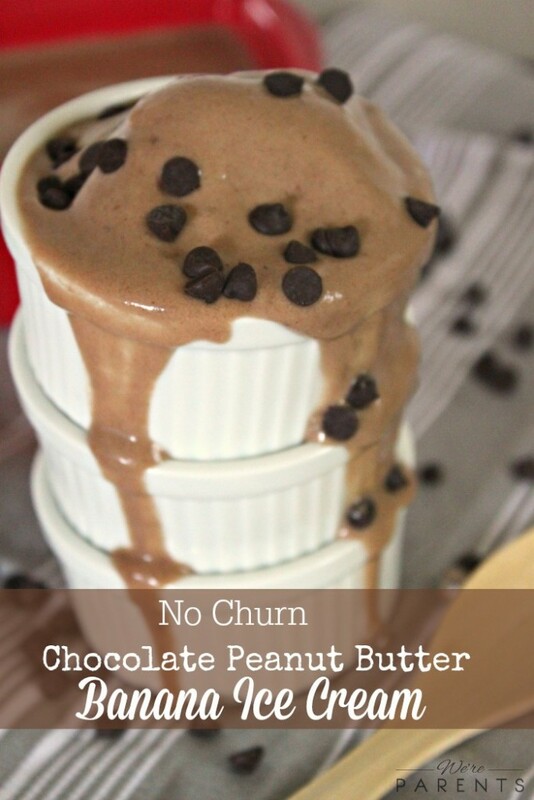 In a medium bowl, add 1/2 cup peanut butter and set aside. Combine the remaining milk, heavy cream and sugar in a medium saucepan and place over medium heat. Bring the milk mixture to a low boil. Cook until the sugar dissolves, 3 minutes. Remove from the heat and gradually whisk in the cornstarch mixture. Return to a boil and cook over moderately high heat until the mixture is slightly thickened, about 1 minute. Pour into the bowl with the peanut butter and whisk until smooth. It will looks like tiny peanut butter pieces throughout. Set the bowl in the ice water bath to cool for 20 minutes. Whisk together. Then, cover and refrigerate until well chilled, at least 4 hours or overnight. 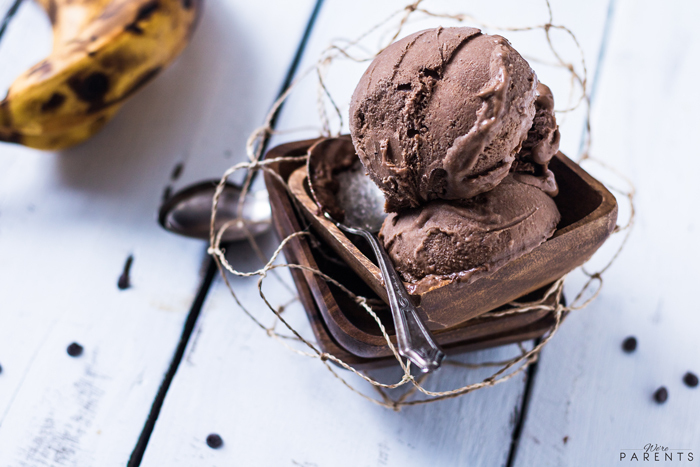 Once chilled, pour the ice cream based into an ice cream maker and churn according to the manufacture's instructions. 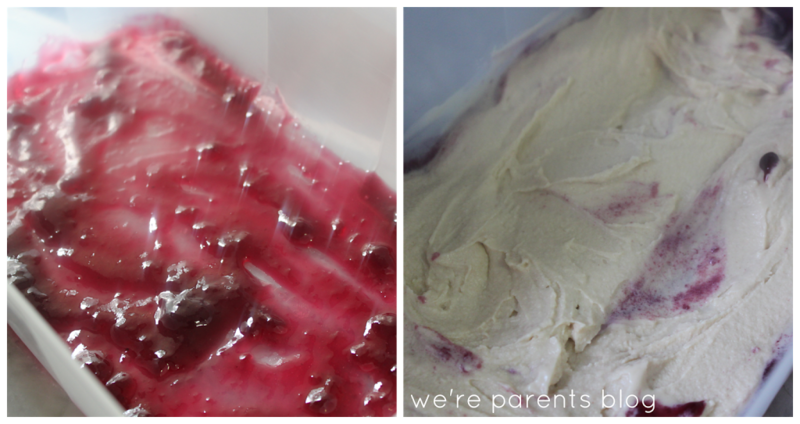 Spoon a small layer of jam into a freezer-safe container. Then, lightly spoon a layer of ice cream on top. Drop 1/2 tsp globs of peanut butter on top and use the tip of a knife to carefully swirl it around. 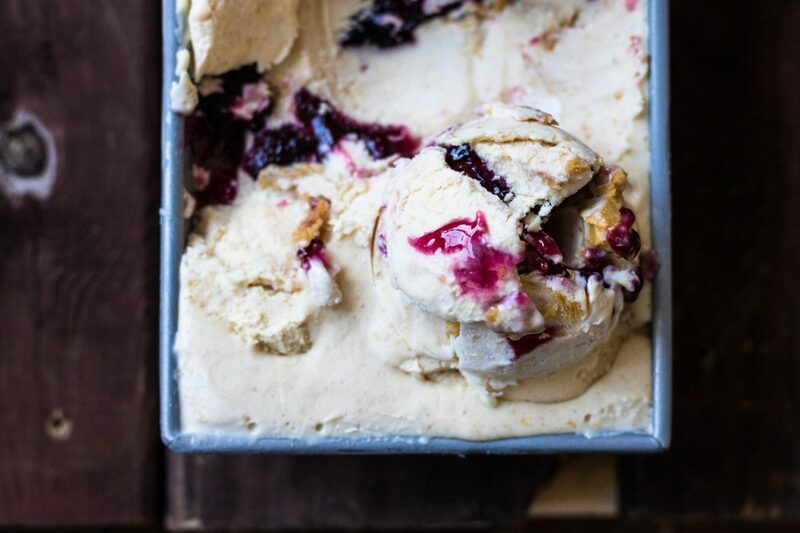 Continue to alternate layers of jam, ice cream, and peanut butter until the container is full. Freeze until firm, at least 4 hours. Optional: Add chopped nuts to the layers for an added crunch or use them on top. 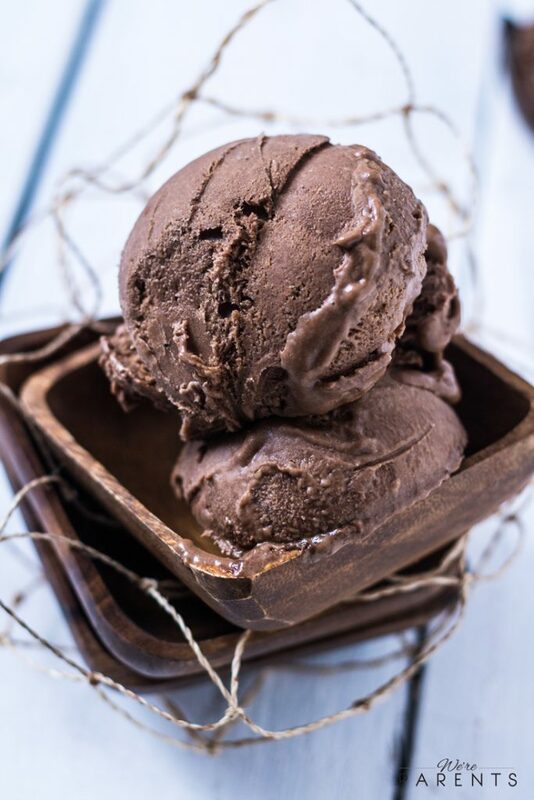 *Recipe adapted from Scoop Adventures: The Best Ice Cream of the 50 States. Optional chopped peanuts are not included in nutritional facts. Recipe can easily be doubled. 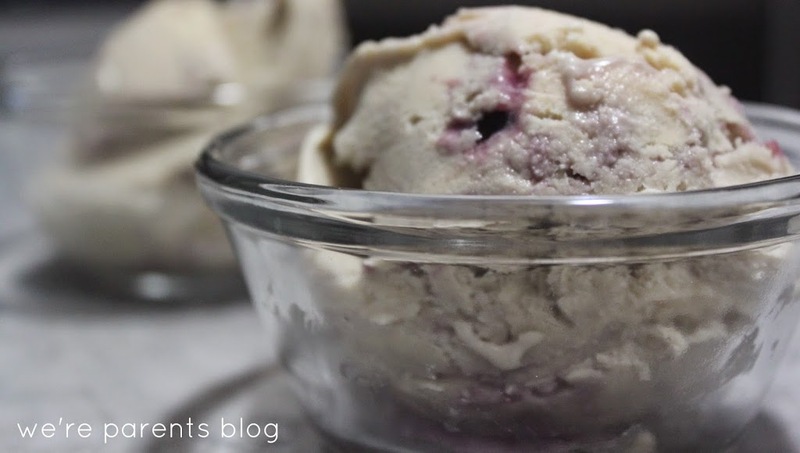 Pin this Homemade Peanut Butter and Jelly Ice Cream for later! Scoop Adventures: The Best Ice Cream of the 50 States is available now. Some of the other homemade ice cream recipes that sounded amazing to me are: Chocolate Coconut Macadamia Nut, Junk in the Tree Trunk, Mango, Banana Pudding, Chunky Turtle, Pumpkin Ale, Pennsylvania Dutch Chocolate-Covered Pretzel, Lavender Caramel Swirl….ok, I admit, I could write out almost everyone included in the book. 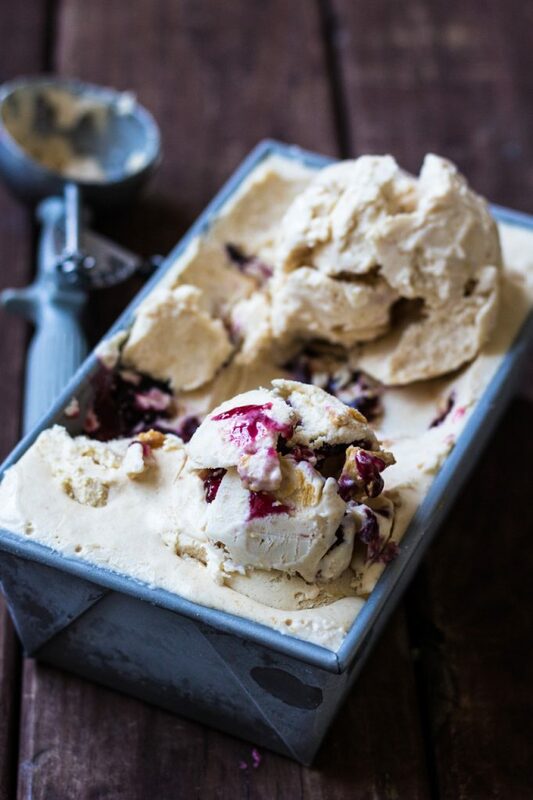 Grab the book and an ice cream maker and get ready for summer deliciousness today! This post was originally posted on 8/15/2014. Same great recipe, but our photography has greatly improved. Some original photos are included below. 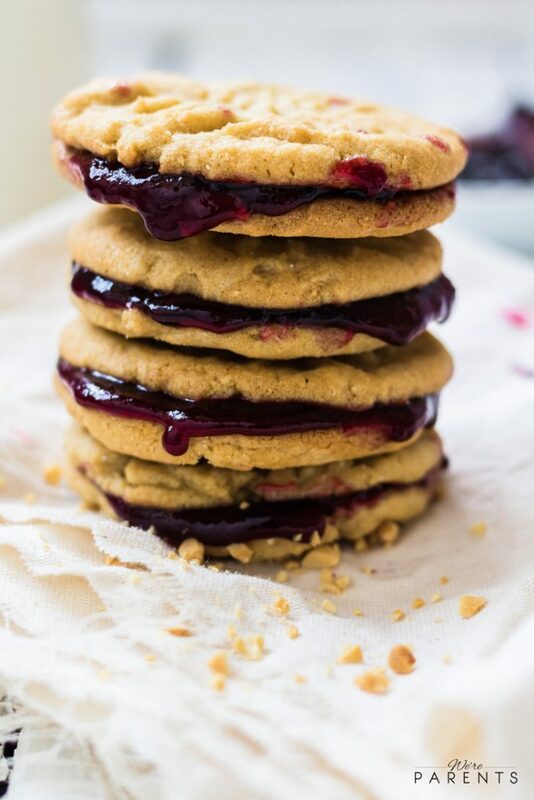 These Peanut Butter and Jelly cookies are one of the most perfect peanut butter and jelly recipes you’ll try. You will wonder why you never thought to create them before! Use different preserves to tons of variations to this simple recipe! Growing up, I wasn’t a fan of peanut butter cookies. I loved cookies and I loved peanut butter, but I was never a huge fan of straight up peanut butter cookies. I always loved making them with my family though because I thought the fun design you got to put on the top of them was really cool and I loved seeing how it grew but was still the same pattern as it cooked and expanded. The nerd in me learned that peanut butter actually makes cookies dense, so you put the fork marks into the cookie to flatten them so they come out soft with crispy edges. It’s the best of both loves in the cookie world. When Andrew and I were discussing what recipes for our Peanut Butter and Jelly series, we both immediately thought of cookies. We debated if we put the jelly into dough or even if we make thumbprint cookies with peanut butter chips. Ultimately, we decided on jam sandwich cookies. 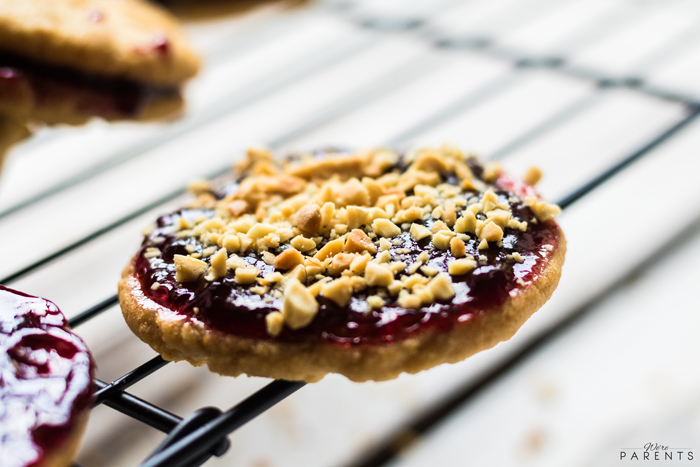 These were the most true to what peanut butter and jelly traditionalists would consider a peanut butter and jelly cookies. These sandwich cookies are super fun and super easy. 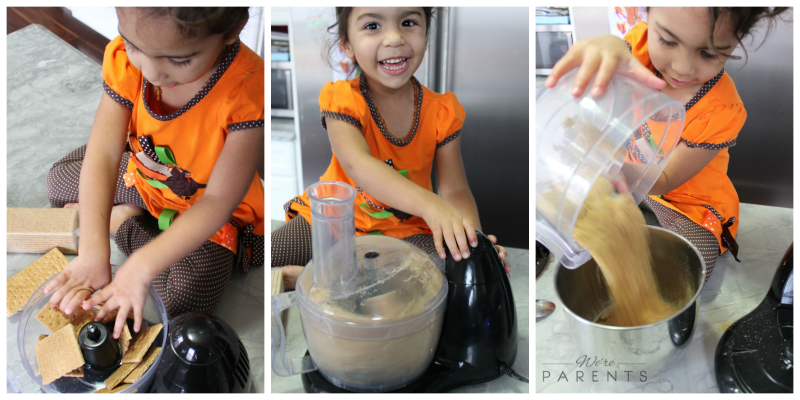 It’s a great way to get the kids involved in cookie making too. 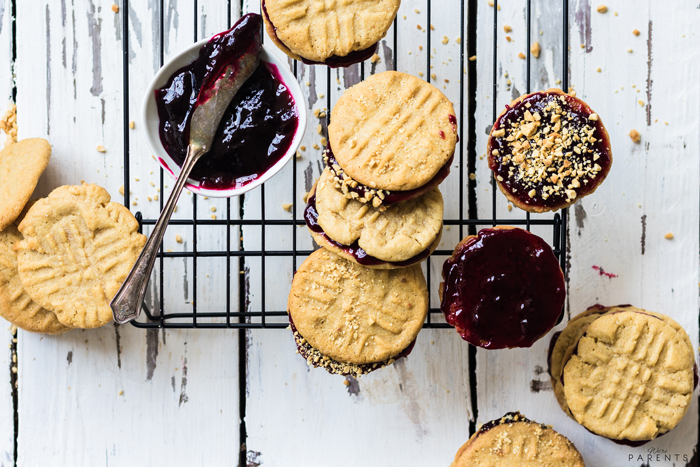 How do you make peanut butter and jelly cookies? To make these peanut butter sandwich cookies, you take a traditional peanut butter cookie recipe and bake it as normal. Once your cookies are cooked and cooled completely, you garnish one side with jelly. Then, top with another peanut butter cookie. The type of jelly is completely up to you. Use traditional grape or often replaced with strawberry. Or, get really creative with blackberry preserves or apricot jam or bacon jam! And to further the crunchy versus creamy peanut butter debate, you can also top with crushed peanuts on the inside if you wish. 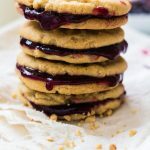 These Peanut Butter and Jelly cookies are one of the most perfect peanut butter and jelly recipes you'll try. You will wonder why you never thought to create them before! 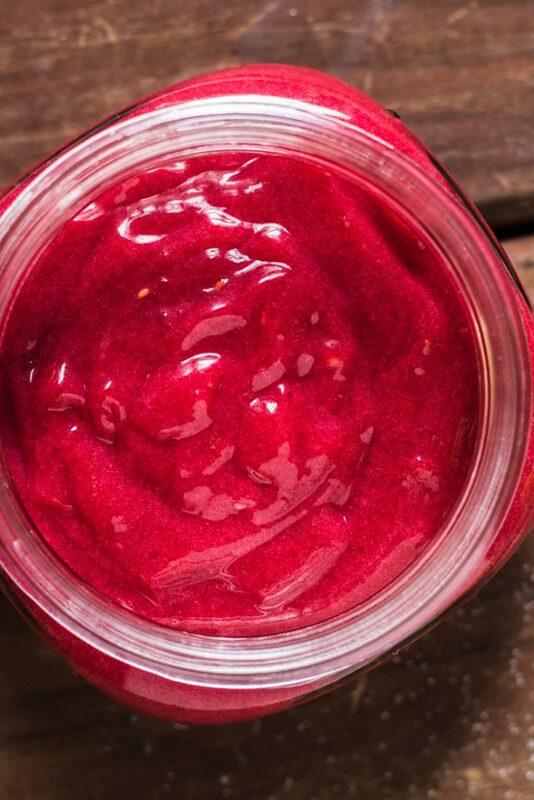 Use different preserves to tons of variations to this simple recipe! In a small bowl, add flour, baking soda, and baking powder. Whisk together. 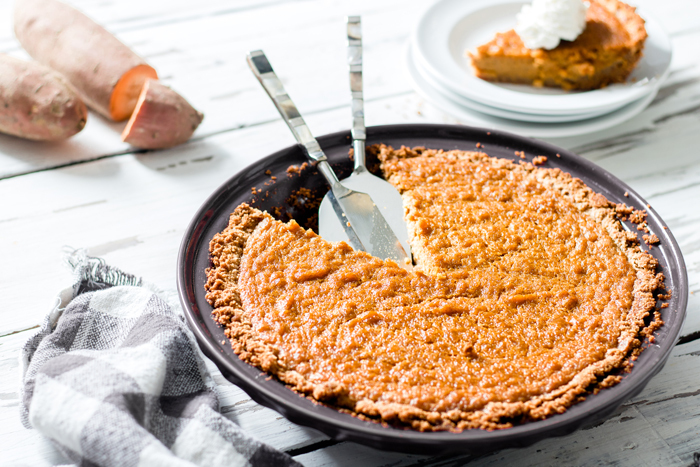 In a large bowl, beat together the softened butter, peanut butter, brown and 1 cup white sugar. Add in eggs, one at a time, and beat just until blended. Add in vanilla just until blended. Slowly add in the flour mixture until blended. 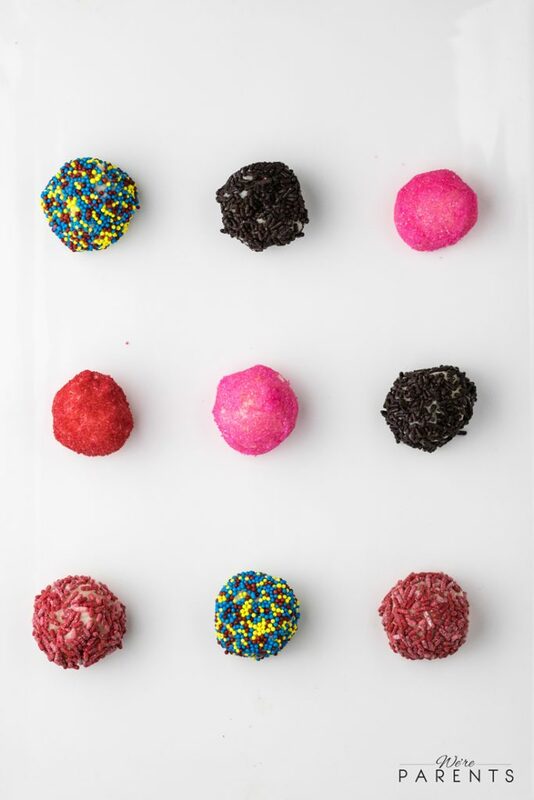 Using a 1-inch scoop, roll cookie dough into balls. Place remaining 1 tbsp sugar in a bowl. Dip a fork in sugar bowl and use it to flatten cookies in a criss-cross pattern. Bake for 9-11 minutes or until edges are golden brown. Remove from oven and let cool for 3-5 minutes until hardened enough to move to a cooling rack. Once cool, spread 1/2 tbsp of jelly on the flat side of one cookie. Top with another cookie. 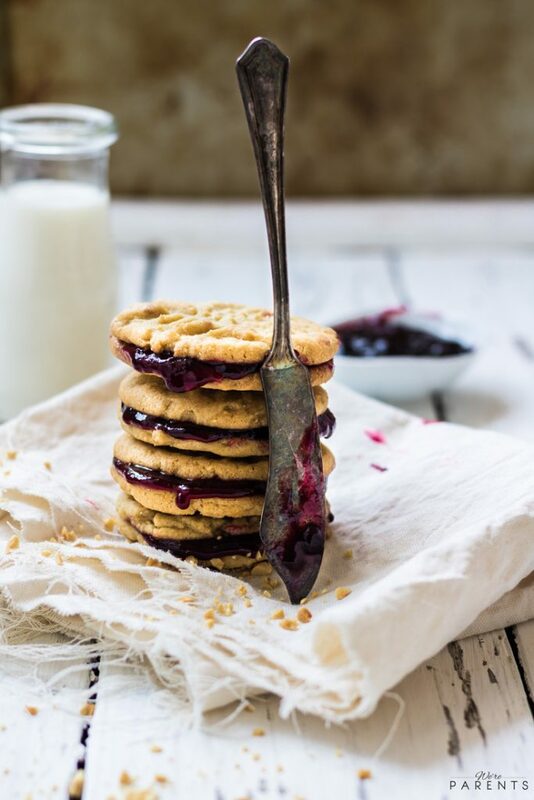 Pin these Peanut Butter and Jelly Cookies for later! 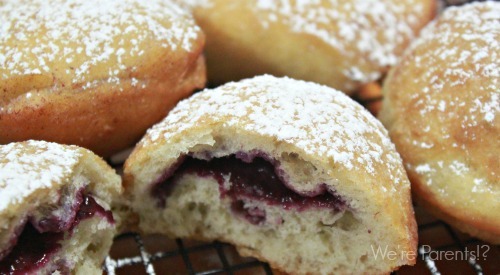 This easy doughnut recipe is a crowd pleaser! 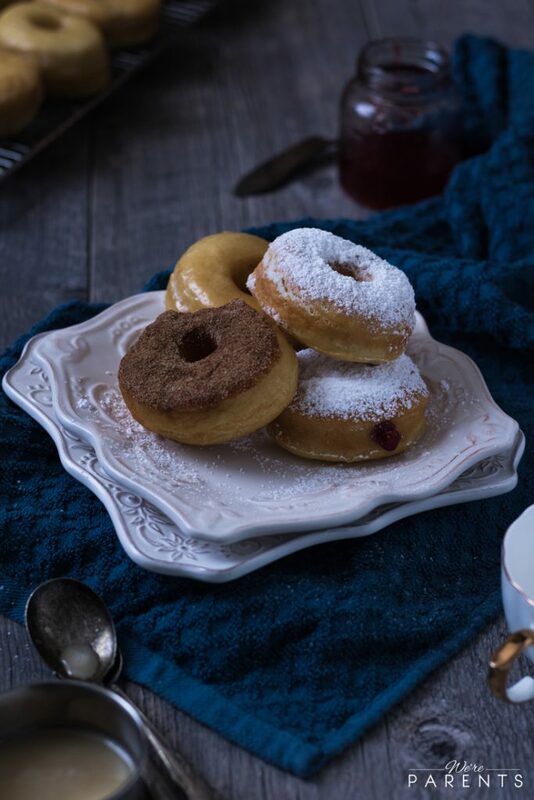 Try to make these dairy free homemade doughnuts each of the four ways, but ultimately the possibility are endless! You’ll never know these are a great dairy free breakfast option! If you know me, even in the slightest little bit, you know that I am one doughnut-obsessed loving person. While I’ve always been in love with them, I can’t really say my true doughnut obsession started until I bit down in a local bakery’s ultra-creme-filled version and then again with local Amish doughnuts. Quite honestly, there’s nothing like an Amish doughnut and if you’ve never had one, make it a bucket list goal. Since then, there’s been no looking back. The way to my heart is officially through doughnuts. I didn’t learn about either of these options until after I had our oldest. 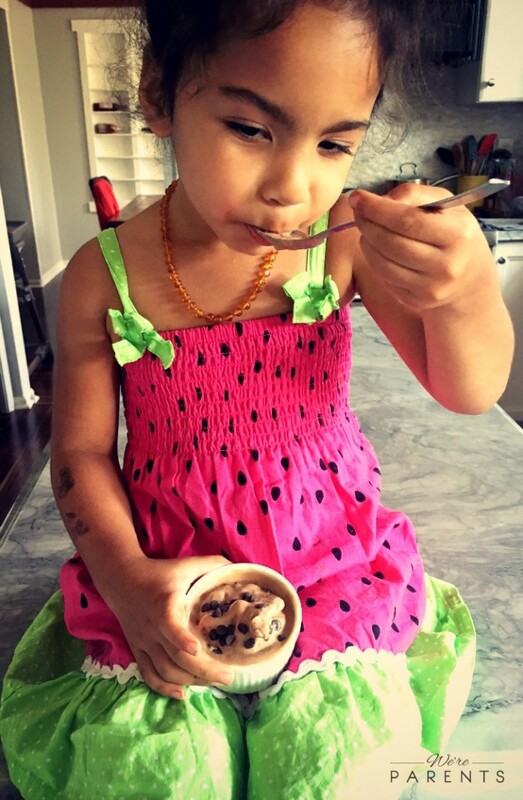 When I was pregnant with our baby, I remembered that I had to be dairy free from 6 months with our oldest because she was essentially lactose intolerant. I wanted a doughnut recipe option when I had the baby in case they same happened (it did). Thus, this dairy free donuts recipe love child was created. How do you make doughnuts at home? The best dough for homemade doughnuts recipe is a yeast dough. Once you have that you knead the dough and let rise twice. After that, you want to roll out and cut your dough. Finally, you fry the dough for 2 minutes on each side. 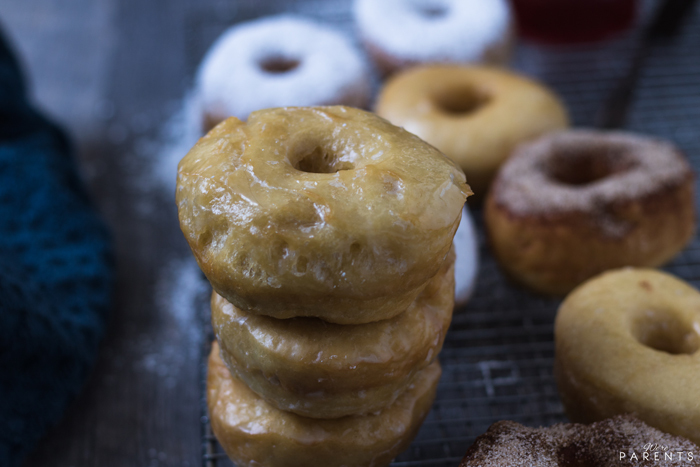 The most amazing thing about doughnut recipes is that once you have the dough fried, your possibilities on the toppings for donuts are endless. Sprinkles, glaze, chocolate sauce, cinnamon sugar, powdered sugar, and more. How do you make dairy free doughnuts? In most homemade doughnuts recipe, milk and butter are used in the recipe. Obviously, dairy is a large allergy for money, so we wanted to make a dairy free doughnut recipe. It was incredibly easy to swap out dairy in the doughnut recipe. You can swap coconut, almond, or soy milk for the regular milk in this donut recipe. For the butter, we swapped with coconut butter. The end result was delicious. Our older daughter, took a bite into one and said, “Mmm, it’s Schurmmy”. That’s her saying “It’s so yummy.” So that’s a win/win in my book. 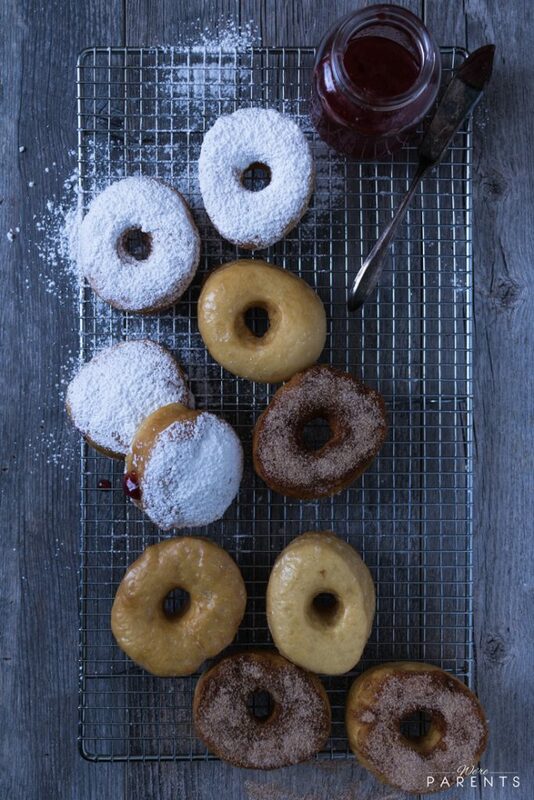 We will definitely be making these doughnuts again and again. If you’ve been contemplating making your own, we highly suggest you get too it now! I couldn’t believe it’s taken me this long! This easy doughnut recipe is a crowd pleaser! 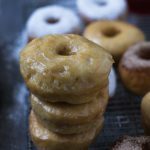 Try to make these dairy free homemade doughnuts each of the four ways, but ultimately the possibility are endless! You'll never know these are a great dairy free breakfast option! To your scalded milk, add sugar, salt, and coconut butter. Stir until butter is melted. After 10 minutes, in a small bowl, add warm water and yeast. Let sit for 5 minutes. In a large bowl, add the eggs and 1/4 of the flour and slightly combine. Add in the milk mixture and another 1/4 of the flour. Combine again. Add in the yeast mixture and another 1/4 of the flour. Combine again. Add remaining flour and combine lightly. Transfer dough mixture to a lightly floured surface and knead for 5 minutes. Place dough in a bowl and cover with a large kitchen cloth. Remove and knead for another 3 minutes. Place back in bowl and let rise for another hour. While waiting, bring your oil to 300 degrees. Once your oil has reached 300 degrees, Cook your doughnuts on each side for 2 minutes. Remove onto a paper towel lined plate to absorb excess grease. 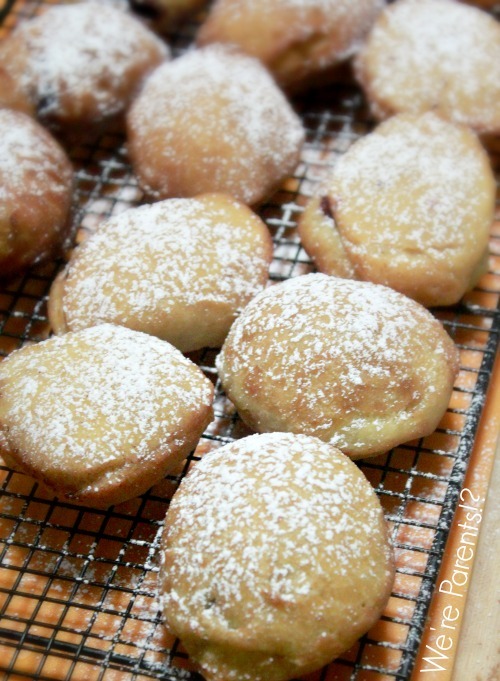 Let cool enough to touch, then add powdered sugar or glaze on top! 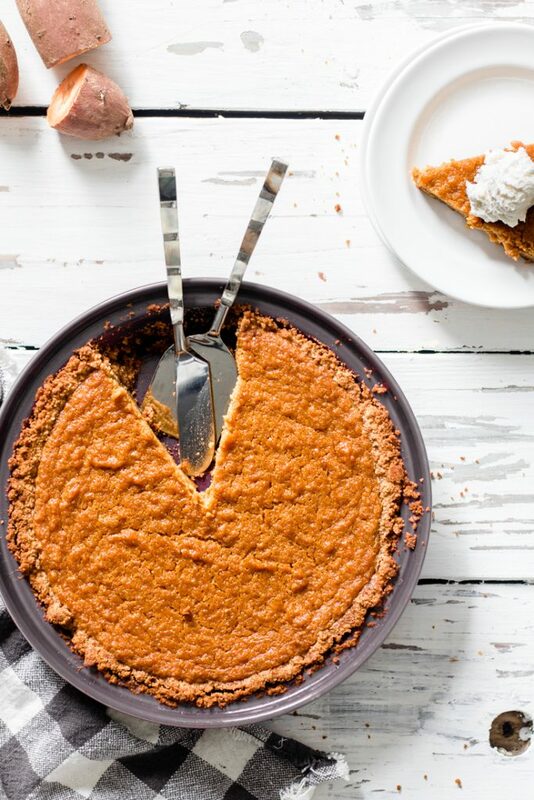 Whisk together 1 cup powdered sugar, 2 tbsp dairy-free milk alternative of choice, and 1 tsp vanilla extract. Nutritional facts calculated using almond milk. Optional toppings and fillings not calculated in nutritional facts. If you do not have a doughnut cutter, you can use a 3" biscuit cutter and then the large end of a pastry tip to cut out the hole. For Doughnut Holes Using a small ice cream/cookie scoop, remove a tablespoon of dough at a time. Cook for 30 seconds on each side, then remove to paper towel lined sheet. For Filled Doughnuts Do not cut center out of dough. Use a biscuit cutter. Cook as normally described above. Once removed pipe choice of ingredient into center. 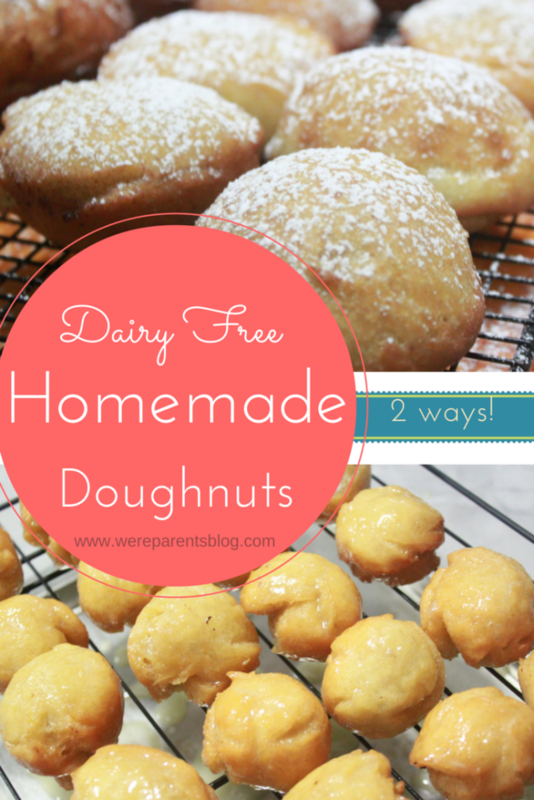 Pin this Dairy Free Homemade Doughnut Recipe today! This post was originally published on 4/17/2015. Pictures below are the originals. 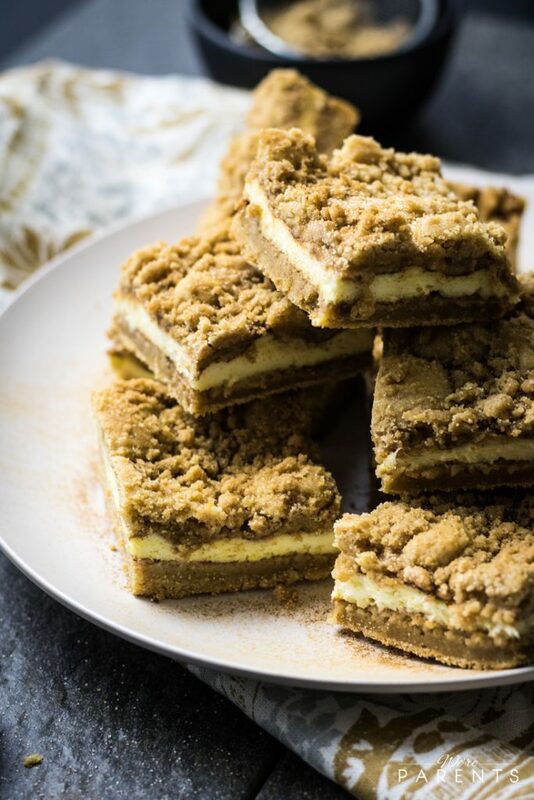 These Snickerdoodle Cheesecake Bars are a hit all year round combining two amazing desserts: Cheesecake and Snickerdoodle Cookies. No matter the time of year, there’s 3 things you can always give me that will instantly cheer me up. Doughnuts, Cheesecake, and Snickerdoodle cookies. Doughnuts are just a love obsession of mine. But cheesecake is like the literal perfect dessert and nothing beats a snickerdoodle cookie. So why not combine them. Well, for now, at least two of them. 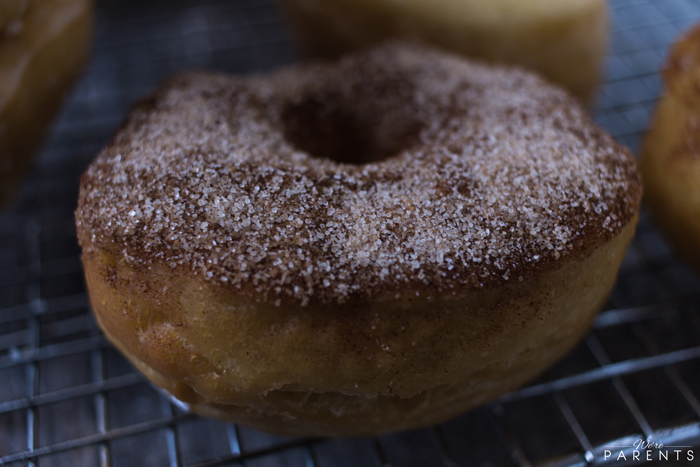 Though snickerdoodle cheesecake doughnuts sound ahhh-mazing. 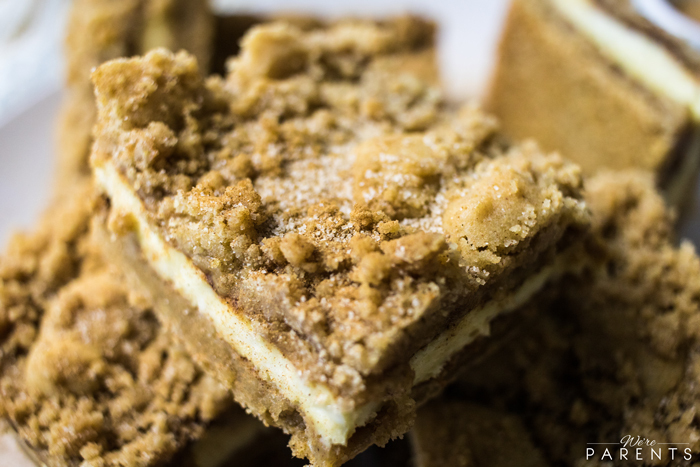 I present to you Snickerdoodle Cheesecake Bars! In case you don’t know, let’s first talk about snickerdoodle cookies. Snickerdoodles and sugar cookies sometimes get mistaken for no difference. Though I’m not really sure how. Snickerdoodles are rolled in a cinnamon and sugar mixture before being baked. Additionally, cream of tartar is added to the dough mixture. Cream of tartar added a tartness to the cookies that isn’t provided in a sugar cookie, as well as aiding to the chewiness of the cookies. 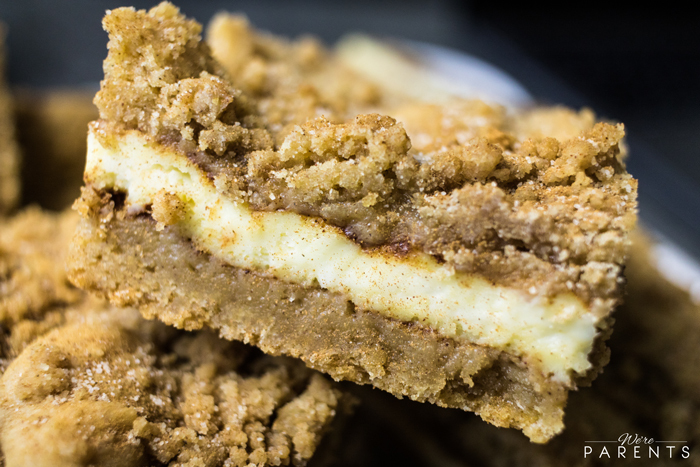 These Snickerdoodle Cheesecake Bars aim to combine the best of both worlds. The base layer is made of a snickerdoodle dough mixture. Then, topped with cinnamon and sugar mix. Next, A layer of cheesecake that is rich and creamy. Finally, the mixture is topped with more snickerdoodle mixture, plus more cinnamon and sugar mix, PLUS a crumbly streusel topping. It’s indulgent. But it’s amazing. 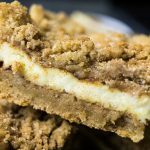 Snickerdoodle Cheesecake Bars are absolutely delicious and a real crowd pleaser. You can easily cut these up into multiple sizes so you can make them as big or little as you want to feed a crowd. Combine all ingredients into a medium sized bowl. Using your hands or a pastry cutter, blend all ingredients until well combined and crumbly. In a large bowl whisk together the flour, baking powder, salt, cinnamon and cream of tartar. Set aside. In a small bowl, combine the 1/4 cup sugar and 2 1/2 tsp cinnamon. Set aside. Line a 9x13-inch baking pan with parchment paper. Grease the parchment paper with coconut oil. In a medium bowl add the butter and 3/4 cup white and 3/4 cup brown sugars. Beat until creamy and well combined. Add eggs one at a time, and mix just until combined. Add in vanilla and mix just until combined. Add the flour mixture to the butter mixture; beat until combined. Reserve 1 cup of dough. Press remaining dough into the bottom of the prepared pan. Sprinkle top with half of the cinnamon sugar mixture from the first step. In a large mixing bowl add the cream cheese and 1/2 cup sugar. Mix well. Beat in eggs, vanilla, and lemon zest until combined. Drop spoonfuls of reserved snickerdoodle dough mixture on top of cheesecake mixture. Sprinkle evenly the crumb topping over the top. Sprinkle top with remaining cinnamon sugar mixture. Bake 30-35 minutes or until center is just set. Refrigerate until cold, then lift out of the pan and cut into bars. Serve immediately or store in the refrigerator up to 7 days. 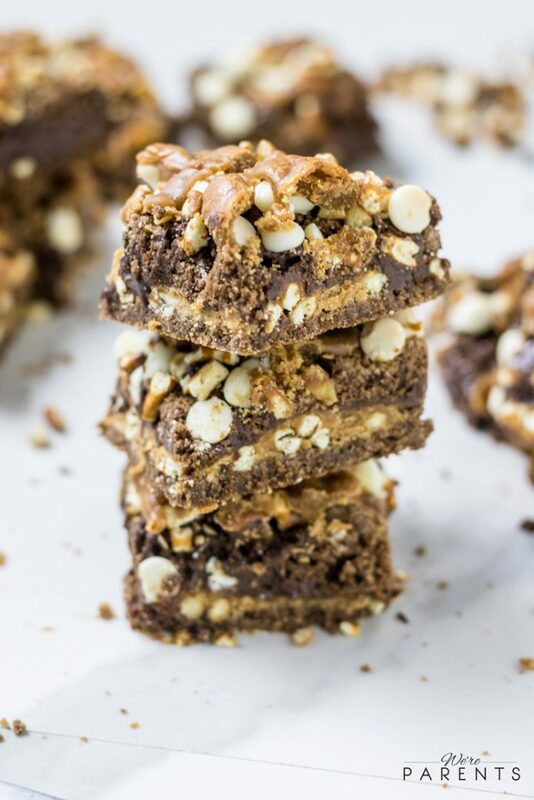 These Salted Caramel Chocolate Streusel Bars are the perfect combination of salty and sweet dessert. A creamy center with a crunchy topping in these chocolate bars makes them the perfect dessert. For some reason, I’ve always loved salty and sweet treats. They are the perfect treat to me. 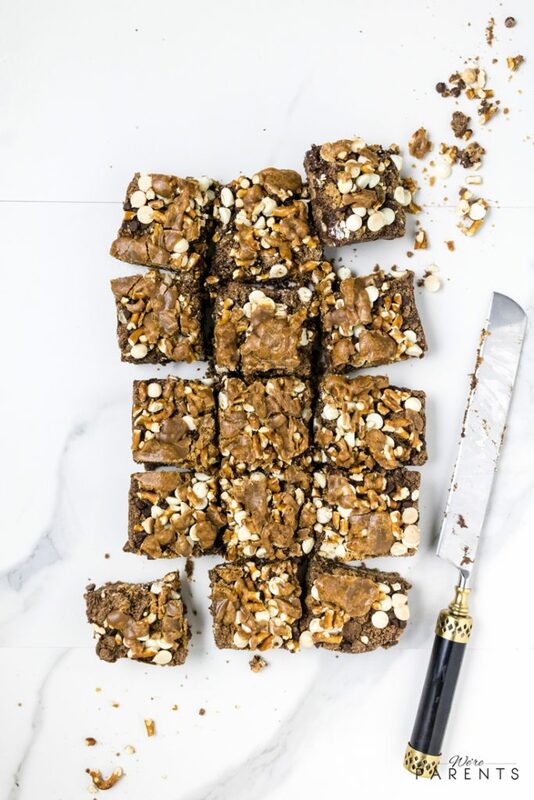 I’m always looking for a new way to combine my favorite flavors together and I think these salted caramel chocolate streusel bars take the cake. The salted flavor comes in the form of both caramel and crushed pretzels. The sweet flavor emerges with chocolate, chocolate, and more chocolate plus sweet milk. A soft creamy center with crunchy pretzels bites, makes this dessert a home run for pleasing all your cravings at once. 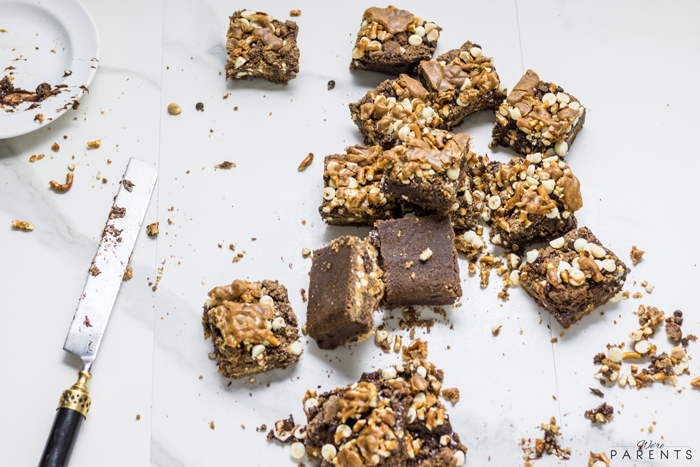 These salted caramel chocolate streusel bars are the perfect recipe to take to your next get together. When they were cooking, the smell that happened inside our house was amazing. You know how something is cooking and you just can’t wait until it’s done because you have to try it. That’s what happened here. I was sitting in front of the oven, watching the timer count down, and begging time to fly by. Luckily, this sweet treat was highly satisfying. 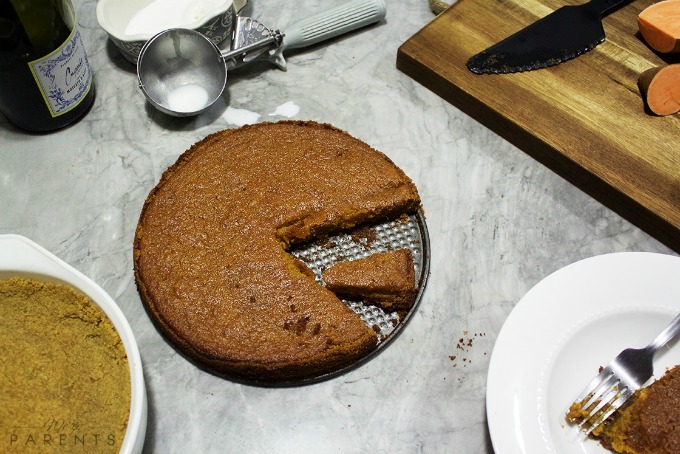 Andrew even said it’s one of the best desserts we’ve ever made…and he’s hard to please! The creamy chocolate center is really what sets this bar apart from so many others. Streusel is a sugary crumb topping that is usually on cakes, bars, or pies. At its most basic level, a streusel topping is made from flour, sugar, and butter. 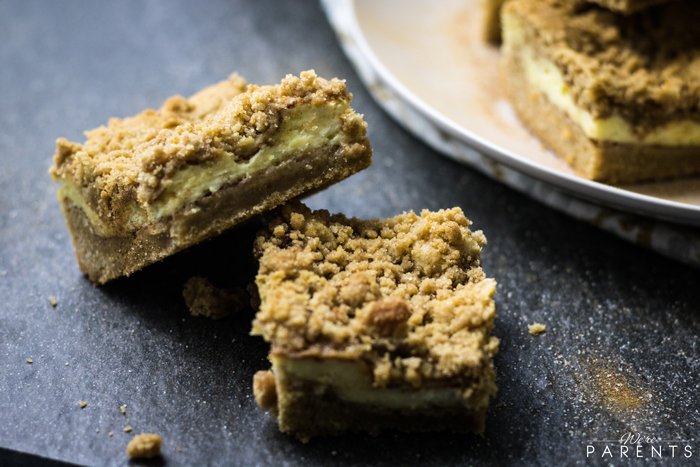 Streusel Bars are when a streusel topping is combined on top of a dessert bars. 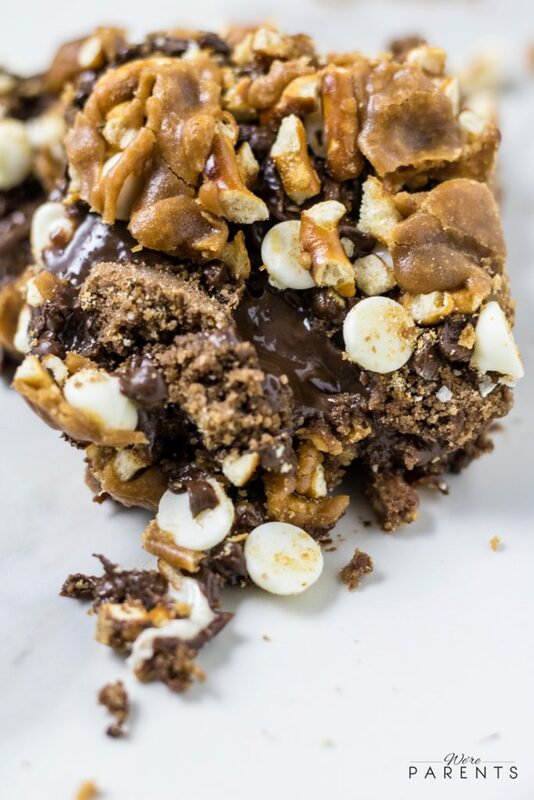 In these Salted Caramel Chocolate Streusel Bars, we combine a streusel topping with a chocolate dessert bar to make a delicious treat all will love. In a large bowl, whisk together flour, sugar and cocoa in large bowl. Add in butter and using your hands or a pastry cutter, combine until mixture resembles coarse crumbs like a streusel topping. Reserve 1 cup of the chocolate mixture. Press firmly the remaining chocolate mixture onto bottom of prepared pan, ensuring an even layer. While that is baking, in a medium sauce pot over medium heat, add all the ingredients for caramel except vanilla. Stir until butter has melted. Then, reduced heat to medium low and let cook, unstirred for 5 minutes (it will bubble but do not stir-if getting close to the top reduce heat). While you are waiting for the caramel to finish, place 1 cup semi-sweet chocolate chips and sweetened condensed milk inside a microwave safe bowl. Microwave for one minute, then stir. If needed, Continue at 15 second intervals until chips are melted and mixture is smooth. Remove caramel from stove and stir in vanilla. Reserve 1/3 cup caramel. 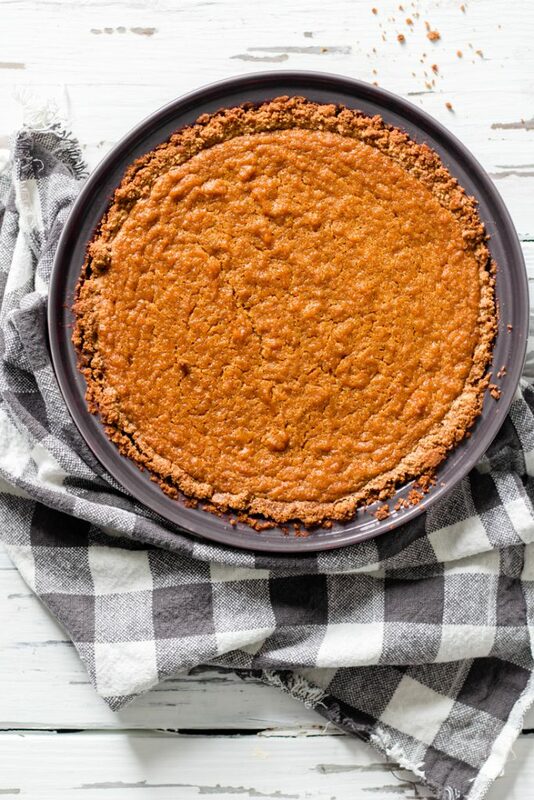 Pour caramel over crust and spread to make even. Add 1/4 cup semi-sweet chocolate chips, 1/4 cup white chocolate chips, and 1/2 chopped pretzels on top of caramel. Pour chocolate and sweet milk mixture next and gently spread evenly. In a small bowl, combine the reserved crumb mixture, remaining semi-sweet and white chocolate chips, and remaining pretzels together. Evenly sprinkle over the top of the bars. Drizzle remaining caramel on top. Bake for an additional 28-33 minutes or until center is almost set. 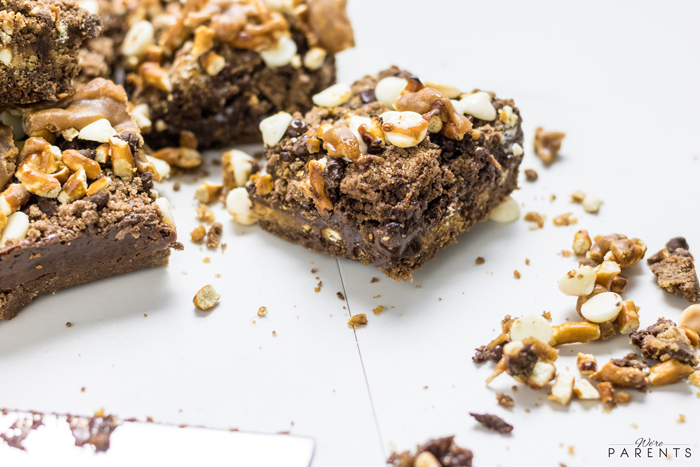 PIN THESE SALTED CARAMEL CHOCOLATE STREUSEL BARS FOR LATER! This simple no bake cheesecake bites recipe is quick to make and a sure home run for everyone. Cheesecake is one of my favorite treats. Sometimes though, I don’t want to go through the entire process of making and baking an entire cheesecake. It’s exhausting. Plus, with the girls, I’m always trying to figure out ways to incorporate them into the kitchen to make their own recipes that are great for their size. Mini sized treats for them mean that this no bake cheesecake bites recipe is the perfect mini desserts to take to your next party or get together you’re attending. 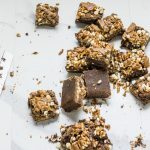 No matter where you are going (shoot, even if you are just staying home and going to devour them all to yourself), they are sure to be a hit with everyone. Bite sized treats are the perfect way to go when you are requested to bring a dessert. How do you make a cheesecake without a springform pan? 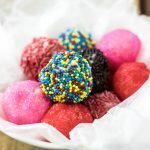 One great way to make a cheesecake without a springform pan is to make these mini no bake cheesecake bites recipe. There’s no need to have a springform pan (or any other pan) making prep, baking, and clean up time a breeze. They are super simple to make just using a basic no-bake cheesecake recipe and adding powdered sugar to make it thicker and hold its shape. Then, rolled in your choice of sprinkles. Use flavored sprinkles to enhance the type of cheesecake bites you are making, like our chocolate mint ones here. 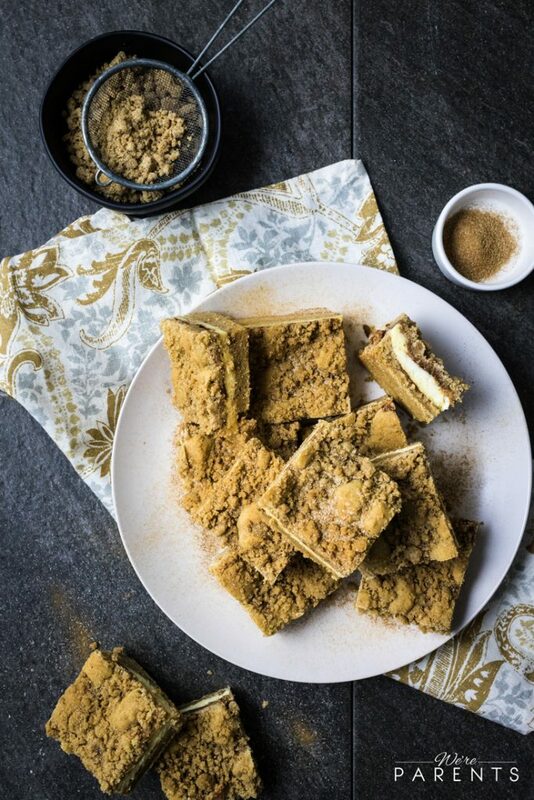 Additionally, for a real cheesecake alternative, you could roll these in crushed graham cracker crumbs. 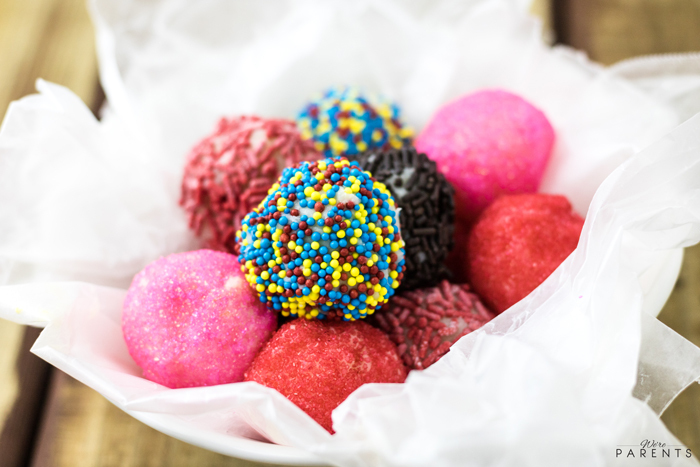 These cheesecake bites are the perfect alternative to cake pops. What toppings could you put on mini no bake cheesecake bites? The possibilities are truly endless. Alternatively, you could dip them in chocolate and caramel sauce similar to these chocolate covered caramel cheesecake bites. In a large bowl, cream together cream cheese and butter for 4 minutes. Add in vanilla and lemon extracts just until combined. Add in powdered sugar and stir until well mixed together. Place bowl into the freezer for 30 minutes to slightly harden. Using a one-inch scoop, scoop out balls of the mixture and place on a wax lined baking sheet. Place into the fridge for one hour. 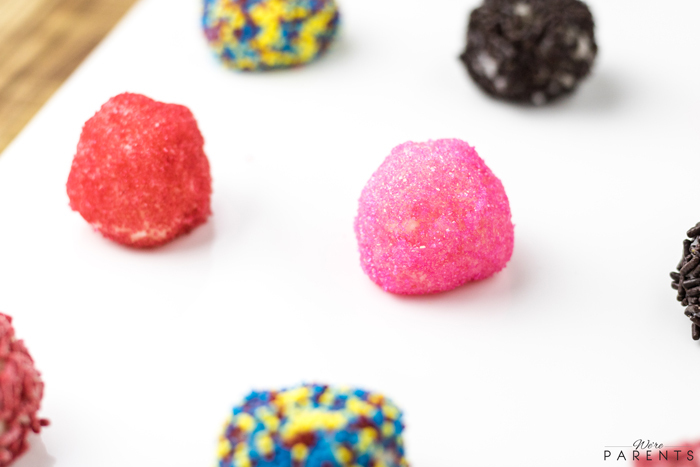 Then roll into sprinkles or other desired topping. Serve immediately or store in an air tight container for up to 7 days. *Nutritional facts do not include sprinkles or other optional toppings.